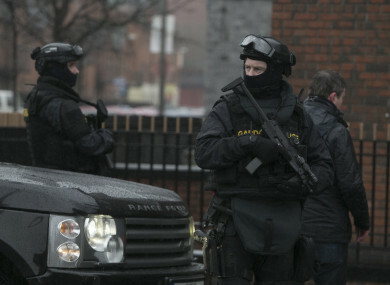 Members of the Emergency Response Unit at a checkpoint in Dublin last year. THE KINAHAN CARTEL was last night dealt a blow after two of its members were arrested on their way to kill a former associate of the gang. Two men, aged 34 and 38, were arrested at the scene on the Kylemore Road in Ballyfermot on suspicion of conspiracy to murder and a loaded gun was recovered. They were planning to kill a well-known gangland target, officers believe, making that the sixth time the man has escaped death. On one occasion, he was shot in a church car park in Clondalkin, west Dublin. He managed to drive his car to a nearby garda station where he collapsed in the foyer. Yesterday’s intended target is not a part of the Hutch gang. However, he was once considered close friends with leading members of the Kinahan’s Dublin operation. He survived other attempts on his life including one time when a gun jammed at a crucial moment. A grenade was also thrown into a house where he was staying in west Dublin. Last night, members of the elite Emergency Response Unit (ERU) had been carrying out surveillance on two members of the Kinahan cartel who are suspected by officers of carrying out gun attacks on behalf of the gang. Gardaí forced the van the men were driving to stop. Armed officers surrounded the vehicle and the men were arrested. The two suspected assassins were dressed in camouflage clothing and there was also a jerrycan filled with petrol in the back of the vehicle. The attempt on the man’s life has not come as a surprise to detectives investigating gangland criminals. At this moment, many senior members of the Hutch gang are in Spain – some have fled due to fears for their safety, others are on holiday. Investigators believe that the man was targeted as he was seen as an “easy kill”. He returned to Dublin late in 2015 after brokering a peace deal with senior members of the Kinahan cartel. He had been accused of tipping off gardaí in relation to drug consignments. He was also accused of sleeping with the partner of a serious criminal based in Dublin’s south inner city. Due to a number of large drug seizures in the west Dublin area in recent months, the cartel believes the man to be talking again and the decision was made to kill him. The man had previously been targeted by the Rattigan gang – one of the main players in the Crumlin/Drimnagh feud which began in 2000 and claimed 16 lives. The apparent professionalism of yesterday’s attempted killing – including the camouflage clothing and the petrol container – has led gardaí to believe that this attack had been well-planned. The intended target had become settled again in an area of Dublin and his movements had become predictable, according to well-placed sources. Both arrested men were taken to Crumlin Garda Station and are currently detained under Section 50 of the Criminal Justice Act 2007. They can be held for up to seven days under this gangland legislation. Email “Man escapes sixth attempt on his life after two Kinahan gunmen arrested in Ballyfermot”. Feedback on “Man escapes sixth attempt on his life after two Kinahan gunmen arrested in Ballyfermot”.